Relatively new to Festool and the board. Bought a few sanders and a dust extractor about a month ago and am really pleased with performance and results. Have only used on painting projects nothing woodworking yet. Have a project coming up where I think a Domino joiner might be useful. Bathroom remodel. Customer currently has a series of "panels" on wall that were made from 1x3 pine and painted. 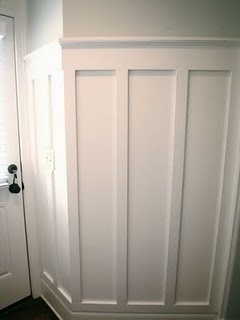 There are no actual panels within the trim it is just drywall painted white. She is unhappy with results and how it has held up. Joints have visible gaps, etc. Wants it redone (along with some other renovations). Was thinking this would be a good opportunity to buy a new Festool tool and put it to use. So would a Domino be a good choice for this project and if so, which one. There is about 20 linear feet of wall where trim would run horizontal at about 35" up from floor and at floor. There would be approximately 13 pieces running vertically and 5 corners that would require a two pieces joined together. I already own an older Porter-cable biscuit joiner that I could use instead, just thinking about adding a new tool. Was also considering using a stile and rail bit set to make a fancy profile and add actual panels within the frames. Many thanks. Also if this was assembled using domino tenons (sorry if that is not the right word), does it have to be assembled and clamped before being attached to wall or can it be put together and attached at wall at same time? In other words, would it be OK to cut the joint, glue and put in a tenon and just staple/nail/screw it to wall to dry? It is just trim no structural purpose or other stresses will be placed on this after installation. Some pictures or a drawing might help us answer that. If you did dominos it would have to be glued and clamped for the joints to not separate. I would just use pocket holes and glue, no need for a domino on that. I have done several of those for clients. Pocket screws all the way. I was never fond of putting the frames up against the sheetrock and then using the sheetrock as the panel field. Much prefer assembling the frames and then taking a router with a rabbeting bit from the backside to create a way to inset ply or pdf from the back. The corners of the ply will need to be clipped but when you are done stapling or nailing the panels are flush to the rabbets and flat and ready for painting after the install. The panel system will be so sturdy that relatively few nails will be required to hold it to the wall. PS: I do have a domino. Thanks I am speaking with them tomorrow specifically about upgrading the panel field. I will look into pocket hole kit I've known about them for a long time but never actually used them or own a jig. Seems like a good project to get my feet wet lol. Appreciate the suggestions guys. Here's a quick video showing use of pocket holes to assemble wainscoting. If you look at his YouTube channel, he has several showing building and installing wainscoting. Thanks. I've watched some of his videos before. I’ve built hundreds of wainscot walls like that. A domino would be serious overkill on that application, you could use it and I’m sure someone on here has. You have a solid wall behind, you don’t need a structural joint. All that required is good glue in the joints and if you want to go one step farther, glue all the moulding to the wall. One everything is rock solid with glue, you can make the joints disappear with some filler. Alternatively, I often use a small hand plane that puts a 1/8” radius on the ends to highlight the joints, if you can’t make it disappear, then make it stand out. Yeah I know it's not structural just looking for an excuse to buy a new FesTool I suppose. Glad I asked question though going to order a pocket hole jig for this project. An outcome that was definitely not on my radar. Thanks for suggestions guys much appreciated. Yeah I know it's not structural just looking for an excuse to buy a new FesTool I suppose. But on choosing which one, I went for the "combo" - which I know isn't recommended by Festool - ie a DF700 XL (the big one) together with an after-market 10mm plate and a bit extender. The latter allow use of the DF500 4/5 and 6mm bits - and the plate allows depth settings below 10mm (but you have to add 10mm to the scale when setting of course). Works great.